Get the goodness and taste of 5 grains in your diet everyday. From Weet-Bix, Multi-grain is a unique combination of Oats, Rye, Sorghum, Rice, and Wheat with a blend of honey and coconut for a delicious taste. Specially formulated for busy people who embrace a healthy lifestyle. Wholegrain Cereals (73%) (Wheat (39%), Rye (12%), Sorghum (11%), Oats (11%)), Rice, Sugar, Puffed Wheat, Barley Malt Extract, Coconut (1.5%), Salt, Honey (0.5%), Palm Oil, Vitamins (Niacin, Thiamin, Vitamin E (Contains Soy) Riboflavin, Folate), Mineral (Iron). Weetbix multigrain biscuits contain not one but four wholegrains – oats, rye, sorghum and wheat, are high in dietary fibre and contribute valuable vitamins and minerals to my diet. They are not too sweet, are low in fat and best of all look appetising, not like cardboard! Ideal for serving either with milk, yoghurt or fruit juice and your favourite fresh fruit. They are the one thing I couldn't do without when I moved from Australia to the UK and couldn't find an equivalent cereal over here. Thank you SANZA for stocking them!! 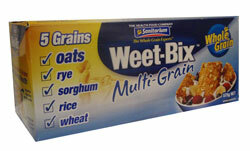 Can't live in the UK without Sanitarium Weet Bix! There is nothing comparable over here - every other biscuit cereal really does taste and looks like cardboard. Please keep stocking it, SANZA! This is so different to the Weetabix you get in the UK and they don't do a multigrain version.